Vegetables Get Star Billing in the Healthy Comedy, "Onion Revolt!" This original theatrical performance uses humor, and colorful characters to get its message across. FLINT, Mich. - March 20, 2014 - PRLog -- Vegetables have never been more celebrated as they are in the one-woman show, "Onion Revolt!" Semaj Brown is the show's creator and star of the healthy comedy, and her husband family physician Dr. James Brown is the composer of the show's music, and its musician. The talented husband and wife team are taking their years of teaching healthy lifestyle living to the next level by staging a full theatrical performance at the Bower Theater in Flint, Michigan, April 26, 2014. The Browns are essentially bringing their former radio broadcast to life with "Onion Revolt!" 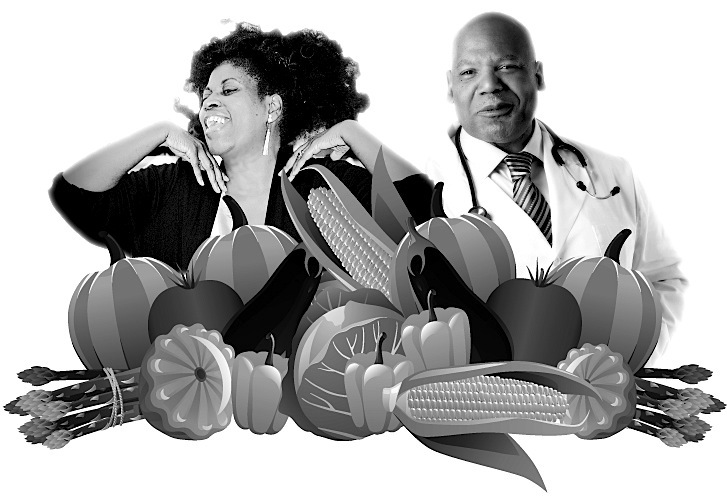 They became a local healthy living cult favorite when they hosted their radio show, and generated a lot of excitement during Dr. Brown's "Pounds Down Challenge", where he challenged members of the community to change their diet, exercise and to make a permanent healthy lifestyle change in their lives. The incentive to participate in the challenge was a $1,000.00 prize from Dr. Brown's medical practice. The couple have given so much of themselves to the Flint, Michigan community--and they're not done giving. The "Onion Revolt!" theatrical show is what they hope to be one of many, as they desire to take the show on the road by way of sponsorship. "The message of good health, and living a healthy lifestyle is so important, we want to share our comedy all across our nation," says Dr. Brown. As a published Broadside Press poet and author, Semaj has fans from her hometown of Detroit, who have organized a bus trip from Detroit's Harmonie Park to take fans directly to the Bower Theater in Flint for the performance. Those boarding the bus, receive an admission ticket, round trip transportation to and from the Bower Theater,and gain access to a reception and book signing after the performance. "We are receiving messages on Facebook from people who will attend the show, that they will be dressing as their favorite vegetable! I am encouraged by their enthusiasm, and hope it continues to spread," says Semaj. "We are also thankful to our fundraising associates, The Links, Incorporated-Flint chapter, State of Michigan Zeta Phi Beta Sorority, Incorporated, The Pierians Greater Flint, Inc. and St. Luke's N.E.W. Life Center, for believing in our work." To get connected to the Planted Kingdom® Project, visit the Browns' Facebook page to get healthy lifestyle tips, delicious plant based recipes, and all of the details for their upcoming "Onion Revolt!" theatrical performance, visit http://www.facebook.com/plantedkingdom .